Enigmatic Rambles: Summer Nail Challenge: Jubilee Party! 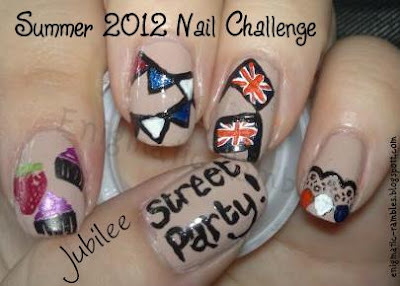 I won't be attending any Jubilee Street Parties or any celebrations, but that won't stop me stepping up to the challenge and having a go at some relevant nail art. this is super fabulous !!!! Thanks Debbie it means a lot hearing from you! I love this :) very cute! Thank you, it was fun. Just because its over doesn't mean you can't do something slightly British, especially with the Olympics coming up.